When deer season is long gone and thin ice renders much of America’s waters unable to be fished, outdoors enthusiasts in the know turn to other pursuits to get their nature kicks. While the mid-spring mushroom bloom is still more than a month away, there are a few hardy species that brave the cold and rear their fungal heads at the first sign of thaw. Why bother waiting for morels or other highly sought after mushrooms when you can get in on a lesser known but equally rewarding hunt from mid-March through the year? Oyster mushrooms are a common sight in farmers markets and grow-your-own kits, but their wild pursuit doesn’t require a competitive nature like that of morels. Like so many other wild mushroom favorites of the United States, the oyster mushroom has been enjoyed in Asia for thousands of years for both its flavor and medicinal benefits. It seems like every health buzzword has been tagged on the oyster, and rightfully so. It is a low calorie, fat-free, cholesterol-free, gluten-free low sodium superfood. High in protein, fiber and iron, it also boasts high levels of zinc, potassium, calcium, phosphorous and the vitamins, B1, B3, B5, B12, C and D. As if that’s not enough, the mushroom is cholesterol lowering, anti-oxidant and has anti-cancer properties as well. Aside from all the health benefits associated with eating the oyster mushroom, perhaps the most immediately satisfying effect is the physical outdoor pursuit of the widely available fungus. Even in the dead of winter, a brief spurt of a few days above freezing temps will bring the oyster out of hiding. The best time, however, is after the first real thaw of spring. The oyster mushroom is the fruiting body of Pleurotus, a genus of fungus that works to decay dead and dying hardwood trees. 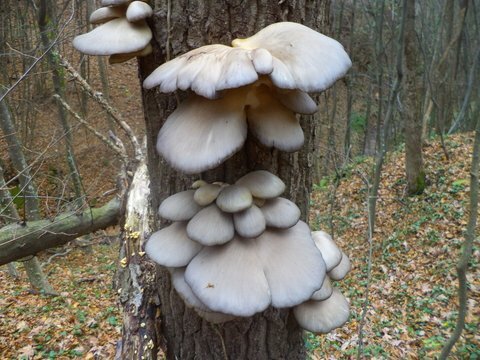 With this in mind, searching for the oyster mushroom becomes much easier because all you need is a hardwood forest and an eye for dead or dying trees. Oysters can grow large enough to see from a distance, especially due to the contrast of colors between themselves and dark hardwood. They usually grow laterally, and always off of wood, even if it is buried underground. The underside of the cap is a series of decurrent gills that slowly taper towards the base, which means there is no real “stem” present and separate from the cap, as is the case with many other mushrooms. From chefs to mycologists (those interested in the science of fungi), it is widely agreed that the appearance of the oyster is one of beauty, unlike its more popular spring cousin the morel, which looks like a strange forest floor honeycomb. In addition to the dopamine released in our brain when seeing that first mushroom of the year, the mushroom’s form and color alone are pleasing. Most found in the woods will range from pure white throughout to brown or grey caps with white undersides, but do-it-yourself kits can produce a wide array of other colors from pink to yellow, all naturally, of course. Cooking the oyster is as simple as any typical store-bought button or portobello mushroom. The possibilities are nearly endless, but a simple saute in butter and pinch of salt will reveal its true flavor. So next time you have some free daylight, pry yourself from your couch, put on your dirtiest pair of boots and get out to the woods to acknowledge that the groundhog has long since shown his face. Also, keep in mind that his verdict was an early spring. next articleQuiz: Can You Identify These Different Types of Ducks?